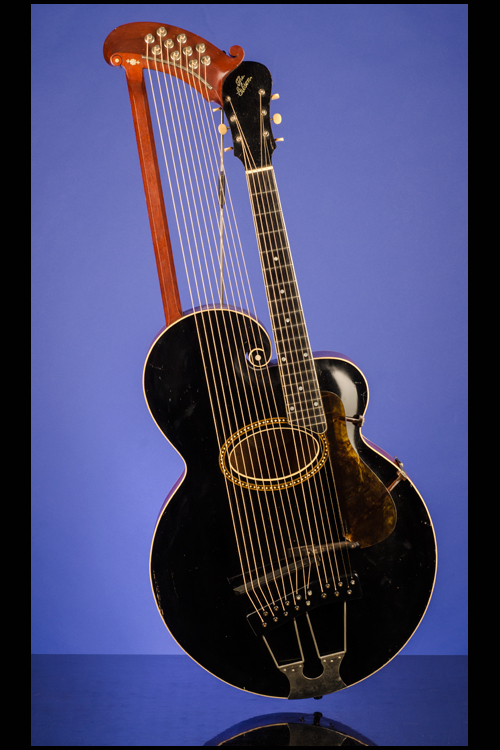 Style 'U' Harp Guitar with 10 sub bass strings Guitars | Fretted Americana Inc.
1915 Gibson Style 'U' Harp Guitar with 10 sub bass strings. 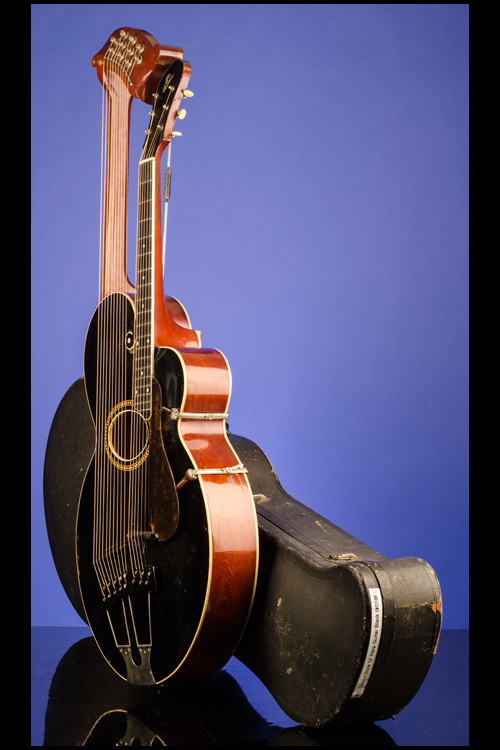 This highly unusual, one hundred-year-old 'Harp' guitar weighs just 10.20 lbs. Single bound finest quality, scientifically graduated, "scroll-shaped" carved 'select' ebony-stained straight-grain spruce top. Ivoroid bound, oval sound-hole inlaid with variegated woods of conventional design. 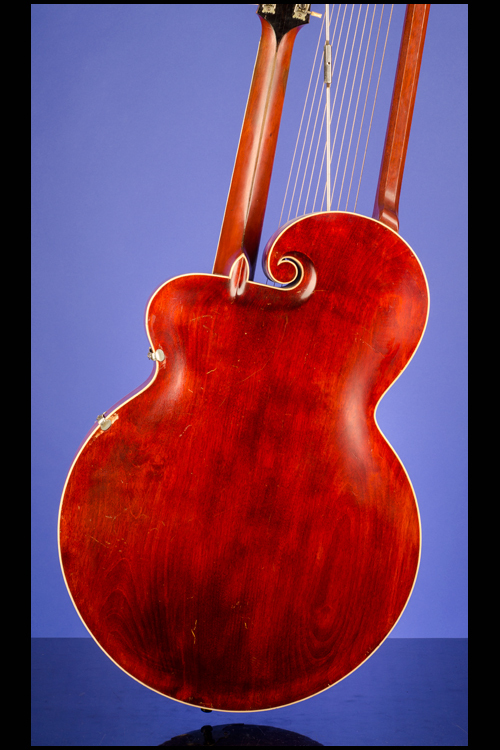 Single-bound one-piece arched mahogany back and mahogany rims. 'Finest selected straight grain' Mexican mahogany neck with a nut width of just over 1 3/4 inches, a scale length of 24 3/4 inches and a huge very thick profile. 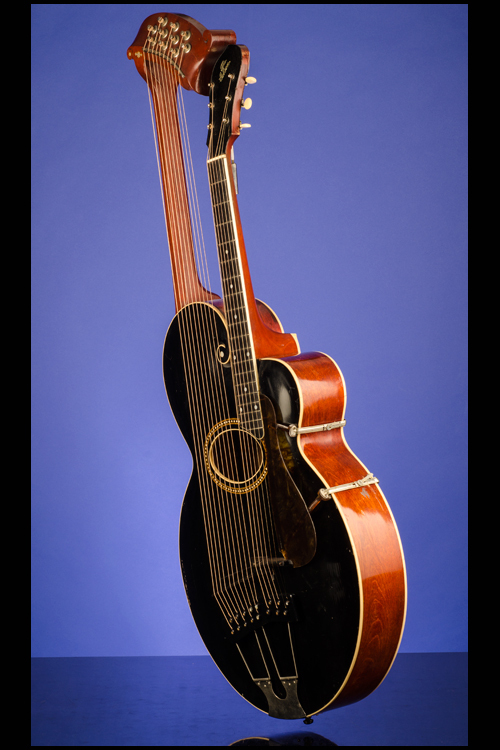 Single-bound, convex ebony fretboard with 19 original thin frets, pearl dot position markers and black dot side-markers. Black faced (front and back) headstock with "The Gibson" inlaid diagonally in mother-of-pearl. Three-per-side open-back strip tuners with white plastic oval buttons. 'Finest selected straight grain' Mexican mahogany 'harp' neck with specific shaped headstock with ten sub bass string 'drums' set perpendicularly through nickeled islets. Nickeled turn-buckle straining-rod running from head of instrument to laminated head-block beneath sounding board. 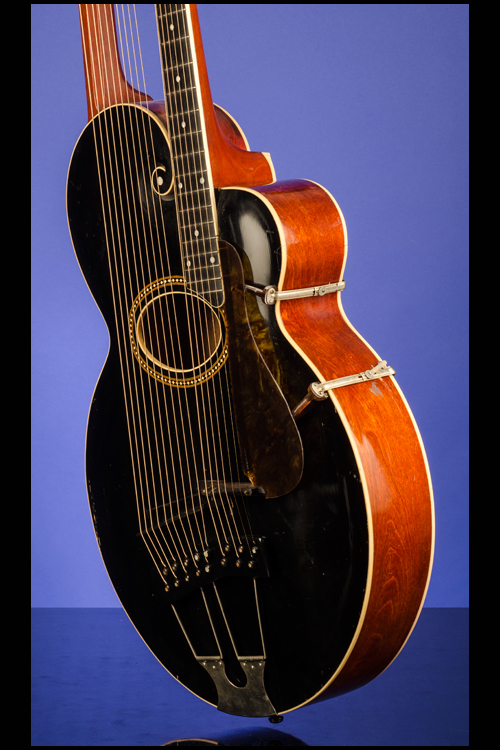 Original elevated tortoiseshell pickguard secured to the treble-side of the body by two German silver clamps (patented July 4, 1911) and two pins into the treble-side of the neck. Six-string guitar with pre-compensated, height adjustable ebony bridge on ebony base. Harp guitar with upright, hard maple bridge with ebony top. 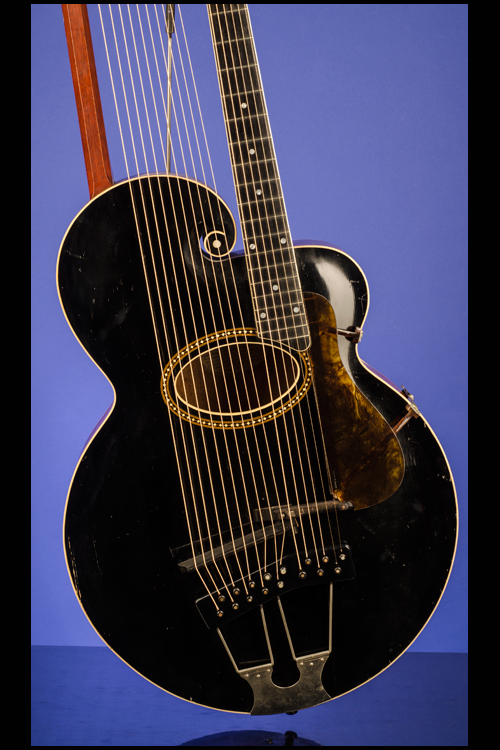 Double 'trapeze' German silver tailpiece with specific ebony elevated string attachments with ebony pegs inlaid with pearl. Trapeze tail secured to bottom edge of body with four screws. Original Gibson oval white label inside sound-hole with "Guitar", style "U" and serial number "21457" written in pencil. The extreme length of this instrument is 45 inches, the body width is 18 3/4 inches, the extreme length of the sub-bass strings from the nut to the bridge is 34 inches and the body depth is just over 3 1/2 inches with the extreme depth being 6 inches. 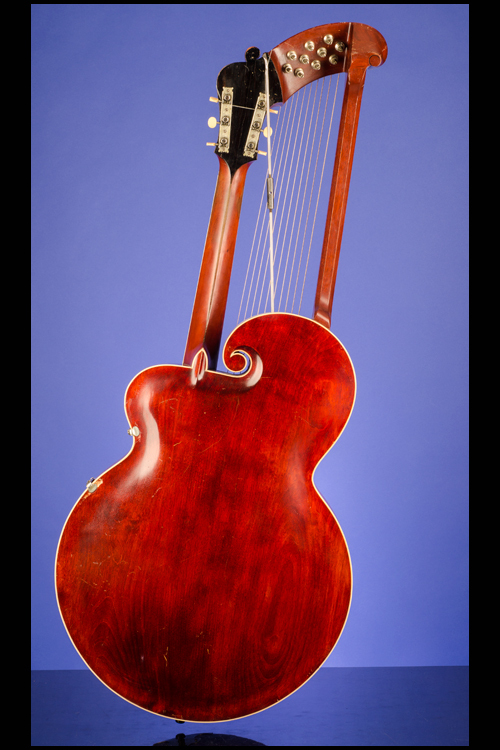 This is by far the cleanest and most original Style U Harp Guitar that we have ever seen and it is in exceptionally fine (9.00) condition. The sound and playability are quite remarkable. Housed in the original five-latch shaped, black hardshell case with purple padded-felt lining (9.00). 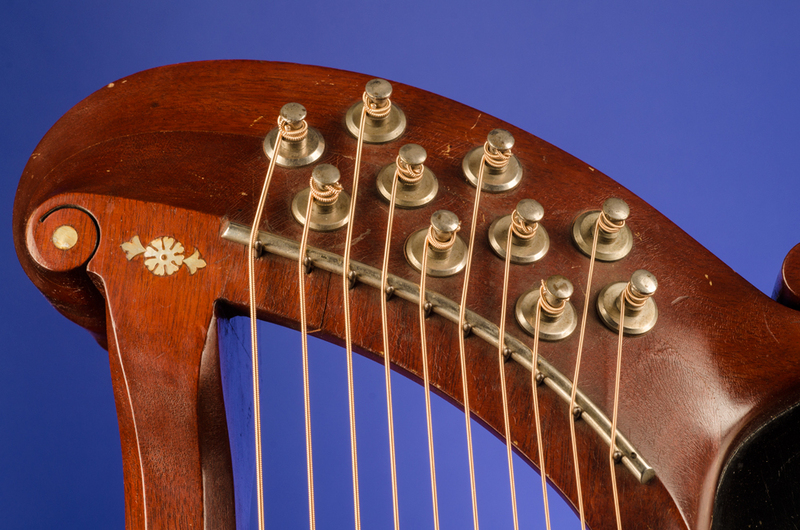 "The harp guitar is just an absolutely wonderful instrument, a gorgeous thing. At one time I would keep it at my house and I used to bash around on it regularly. It plays pretty well, but it's just such a terrific thing to collect - it cries out to be seen, and that really is a good part of the reason I bought it. Ever since I knew they existed, I wanted one. 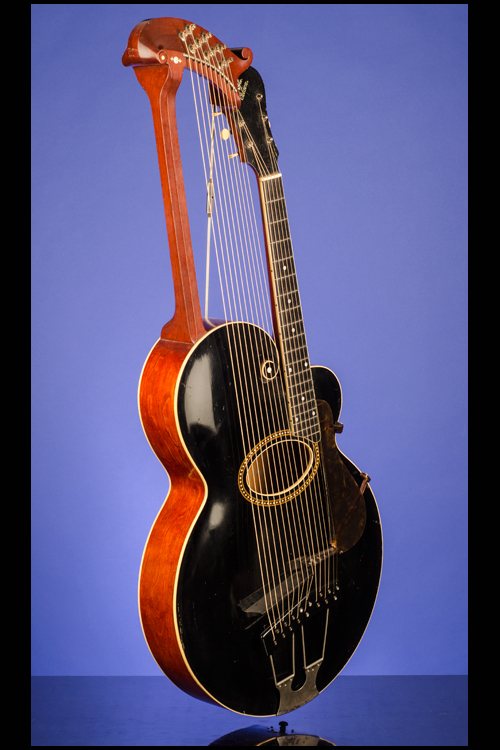 Most of the inspiration came from seeing pictures of harp guitars in the Gibson Story book. 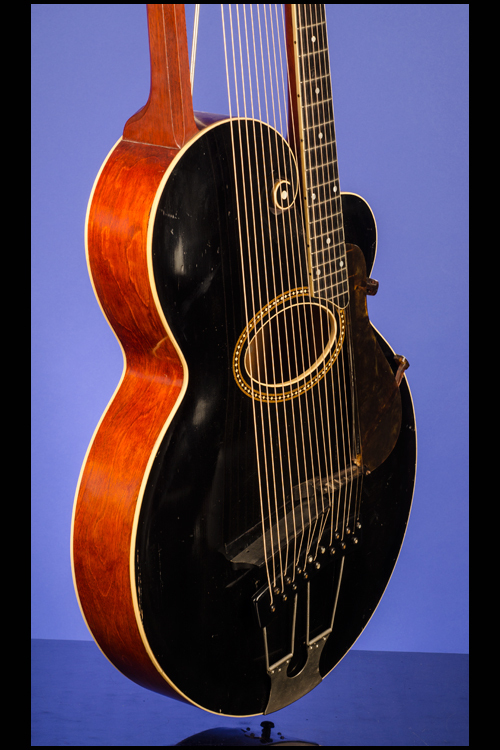 I always hoped to get one like the reverse-scroll Orville Gibson harp guitar that's pictured in there, but I think there's only one in existence - so the chances were remote! 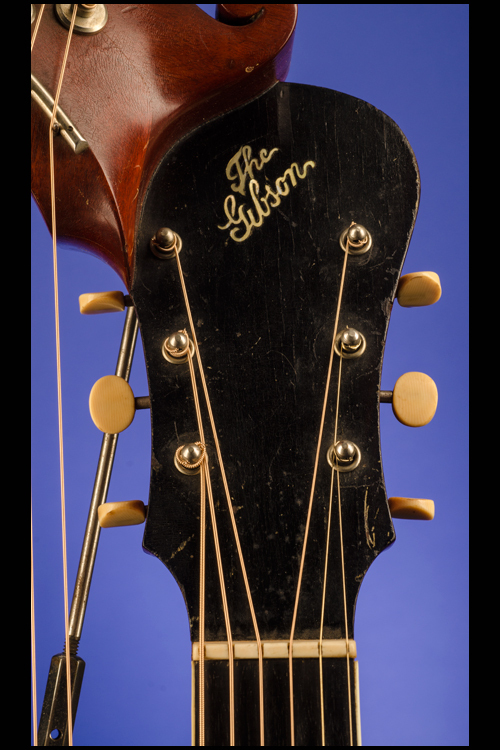 Certainly the one I've got was the most expensive Gibson in its day - in 1928, for example, it was listed at $300 retail, $25 more than the most expensive Gibson, the L-5, and it's a lovely example, very clean, very nicely finished when I bought it, and it sounds absolutely enormous. You play it just like an ordinary guitar, and I use the bass strings for sustain, you can't finger them. It's a bit of a monster. It's so big you have to lean over it and sort of play down on it - you have to look down because it doesn't sit where you'd expect a normal guitar to be. To me it sounds big and honky, rather untamed. I have taken it along to studio sessions, all strung up and fully in tune, but it's never really made it on to any records. Not the most usable guitar, for sure, but I bought it very much as an interesting piece for the collection." (Steve Howe. The Steve Howe Guitar Collection, pp. 11-13).